C. H. F. Peters discovered asteroid #72 Feronia (named after the Italian goddess of groves). A. Charlois discovered asteroid #284 Amalia. Arthur Eddington made observations of shifted star positions during a solar eclipse, a fact interpreted as confirming gravitational bending of light rays as predicted by Albert Einstein's theory of relativity, and thereby confirming the theory itself. In a V-2 chemical release mission launched from White Sands, New Mexico, rocket # 4 reached 112.4 km, and carried cosmic radiation (Applied Physics Lab, John Hopkins University) experiments for General Electric. NASA's Manned Space Flight Management Council approved the mobile launcher concept for the Saturn C-5 at Launch Complex 39, Merritt Island, Florida. The Titan 2 vertical test facility (VTF) at Martin-Baltimore was activated. The VTF comprised a 165-foot tower and an adjacent three-story blockhouse with ground equipment similar to that used at complex 19. In it, the completely assembled Gemini launch vehicle was tested to provide a basis for comparison with subsequent tests conducted at complex 19. Each subsystem was tested separately, then combined systems tests were performed, concluding with the Combined Systems Acceptance Test, the final step before the launch vehicle was presented for Air Force acceptance. The US Air Force launched Titan 2 Research and development flight N-20 to test POGO fixes, but it failed 55 seconds after launch due to a fire in the engine compartment. Titan II flight N-20, the 19th in the series of Air Force research and development flights, was launched 29 May 1963 from Cape Canaveral. It carried oxidizer standpipes and fuel accumulators to suppress longitudinal oscillations (POGO). During the spring of 1963, static firings of this configuration had been successful enough to confirm the hypothesis that POGO was caused by coupling between the missile structure and its propulsion system, resulting in an unstable closed loop system. Standpipes and accumulators, by interrupting the coupling, reduced the source of instability. Flight N-20 failed 55 seconds after launch due to a fire in the engine compartment caused by a fuel leak and yielded no POGO data. Although the failure was not attributed to the installed POGO fix, Air Force Ballistics Systems Division decided officially that no further Titan II development flights would carry the POGO fix because so few test flights remained to qualify the weapon system operationally. This decision did not stand, however, and the POGO fix was flown again on N-25 (November 1), as well as on two later flights. NASA launched X-15A Aero heating/VO Stab test mission # 84 in which Joe Walker reached a maximum speed of 6209 kph (Mach 5.52) and a maximum altitude of 28.042 km. During the flight, the inner panel of the left windshield cracked. NASA launched Explorer 28 (IMP 3) into orbit from Cape Kennedy to study the Earth's magnetic field and collect radiation data. L. Chernykh discovered asteroid #2127 Tanya. USSR launched the Meteor 1-15 weather satellite from Plesetsk. USSR's Cosmos 656 landed after a successful test of the Soyuz 7K-T(A9) variant designed for docking with the military Almaz space station, used in the Apollo-Soyuz Test Program (ASTP). 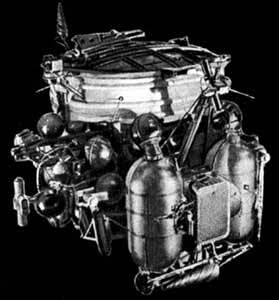 USSR launched the Luna 22 orbiter to the Moon. The NOAA B weather satellite was launched from Vandenburg, but ended up in an unusable orbit after amazingly surviving an extensive set of failures. If successful, it would have been NOAA 7. NOAA B was the second in a series of third-generation, operational meteorological satellites for use in the National Operational Environmental Satellite Subsystem (NOESS) and to support the Global Atmospheric Research Program (GARP) during 1978-84. The satellite design provided an economical and stable Sun-synchronous platform for advanced operational instruments to measure the Eearth's atmosphere, its surface and cloud cover, and the near-space environment. Primary sensors included an advanced very high resolution radiometer (AVHRR) for observing day and night global cloud cover, and an operational vertical sounder for obtaining temperature and water vapor profiles through the Earth's atmosphere. Secondary experiments consisted of a space environment monitor (SEM), which measured the proton and electron flux near the Earth, and a data collection and platform location system (DCS), which processed and relayed to central data acquisition stations the various meteorological data received from free-floating balloons and ocean bouys distributed around the globe. The satellite was based upon the Block 5D spacecraft bus developed for the US Air Force, and was capable of maintaining an Earth pointing accuracy of better than plus or minus 0.1 degree with a motion rate of less than 0.035 degree/second. NOAA B was launched 29 May 1980. At engine start up, one of the Atlas booster engines suffered an internal fuel leak, causing it to run at about 80% thrust. As a result, the booster was low on velocity and heavy on propellant over much of its flight, and ran an incredible 50 seconds longer than the nominal burn. The NOAA Advanced TIROS payload was designed with no direct communication with the booster, and, unaware of the booster problem, at 375 seconds after liftoff, attempted to separate with the booster still firing. The booster's continued thrusting defeated the payload's attempt to perform the required pitch maneuver. When the payload fired its apogee kick motor, it blew the top of the booster's liquid oxygen tank off. The spacecraft survived all this, but the resultant orbit was highly elliptical rather than the desired circular sun-synchronous. The mission was therefore a total loss. USSR launched Molniya 1-54 from Plesetsk, replacing Molniya 1-44, for operation of the long-range telephone and telegraph system in the USSR, and transmission of USSR Central Television programs to stations in the Orbita network. USSR launched Molniya 3-24, replacing Molniya 3-18, for operation of the USSR long-range telephone and telegraph system, transmission of USSR Central Television programs in the Orbita network, and within the framework of international cooperation. The unmanned USSR Soyuz TM 1 undocked from the Mir space station in the maiden flight of the spacecraft that became the successor of the Soyuz capsules used in the Salyut 7 program. USSR launched the Resurs F-06 Earth resource satellite, which also carried a German microgravity experiment in accordance with a commercial agreement, for the purpose of conducting biotechnological experiments. The Alascom Aurora 2 communications satellite was launched from Cape Canaveral, positioned in geosynchronous orbit at 139 deg W in 1991-1999. Aurora 2, an Alaskan owned telecommunications satellite, was launched 29 May 1991 from Cape Canaveral aboard a Delta booster rocket. It provided telephone, television, maritime, radio and emergency communications service for the northern state's long distance carrier, Alascom, as well as radio and data services for GE Americom. The satellite carried 32 C-band transponders (24 primary and 6 redundant) operating at 6/4 GHz. [Ed. note: NASA's math doesn't add up here: 24+6 != 32] Sixteen of the 24 channels served Alaskan customers, 8 served US business. Built by GE Astro-Space for Alascom, Aurora 2 was box-shaped, measuring 1 by 1.64 by 1.4 m. Two three-panel solar arrays, totalling 13 sq. m, extended from either side of the main body. The fixed dual-polarization reflector antenna covered the continental US, Alaska and Hawaii. It replaced Aurora 1, which was retired after 9 years of service. Stationed above 139 degrees W, Aurora 2 became operational in July 1991, with a 12 year life expectancy. As of 30 August 2001, it was at 148.31 deg E drifting at 4.531 deg W per day. NASA's STS 77 (Endeavour 11, 77th Shuttle mission) ended after carrying SPACEHAB and Spartan/IAE into orbit. The US Air Force Space Command transferred control of the Defense Meteorological Satellite Program (DMSP) to the National Oceanographic and Atmospheric Administration (NOAA). NASA's STS 101 (Atlantis) landed after completing the International Space Station Flight 2A.2a mission. The ISEE3 Reboot Project team contacted NASA's ISEE3/ICE probe and commanded it into Engineering Mode to begin sending telemetry.